though we can never learn to forget. Sweet is the sleep of an alien land. in this world of eternal torment. Happy International Children’s Day everyone! Children’s Day is recognized on various days in many places around the world, to honour children globally. It was first proclaimed by the World Conference for the Well-being of Children in 1925 and then established universally in 1954 to protect an “appropriate” day. The International Day for Protection of Children, is observed in many countries as Children’s Day on June 1 since 1950, was established by the Women’s International Democratic Federation on its congress in Moscow (22 November 1949). Major global variants include a Universal Children’s Day on November 20, by the United Nations‘ recommendation. 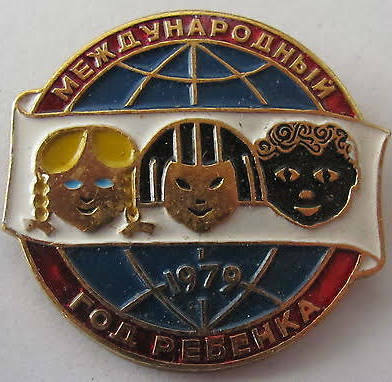 Here is a Russian pin badge celebrating UNESCO’s declaration that 1979 would be the International Year of the Child. Numerous events took place within the UN and in member countries to mark the event, including the Music for the UNICEF Concert, held at the UN General Assembly on January 9. WBZ-TV 4 in Boston, Massachusetts, along with the four other Group W stations, hosted and broadcast a celebratory festival, ‘Kidsfair’, usually held around Labour Day ever since, from Boston Common. Canadian animator/director Eugene Fedorenko created a film for the National Film Board of Canada, called “Every Child“, which centred on a nameless baby who nobody wants because they’re too busy with their own concerns. This was used to explain the importance of how every child is entitled to a home. Sound effects were created with the voices of Les Mimes Electriques. …The pin badge, to a modern eye, does look more than a little bit racist doesn’t it?